Don’t take it personal if Ella Peters and Lauren Treolo are “saving” their voices. That’s only to ensure they are definitely heard at the upcoming Regional Poetry Out Loud Contest. The Selah High School duo advance to the regional contest after qualifying for the event during their school competition. The regional competition will be held at Yakima Valley College in February. Peters, a freshman, will represent Selah as the school’s champ ion, while Treolo, a junior, earned second place honors. Top performers from the regional competition have the opportunity to advance to a state event with the culmination being the national contest. As part of the school’s contest five student participants recited two poems of various style and voice. The students tackled the challenge of memorizing and reciting their selections in front of an audience. 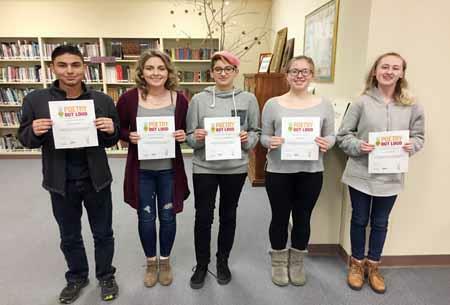 In addition to Peters and Treolo, Selah High School poetry participants included Isaiah Chavez, Hailey Kincaid, and Victor Gray Santana. Poetry Out Loud is a program that encourages students to learn about great poetry through memorization and recitation. This program helps students master public speaking skills, build self-confidence, and learn about literary history and contemporary life. Poetry Out Loud combines the dynamic aspects of poetry, spoken word and theater. Since 2005, Poetry Out Loud has grown to reach more than 3 million students nationwide. Congratulations to Ella Peters and Lauren Treolo as they advance to the Regional Poetry Out Loud contest. Don’t take it personal if they are “saving” their voices. After all, they want to be heard!